Mr. Media is recorded live before a studio audience of website coders with no sense of design but without whom we’d be trading posts in nothing but 0s and 1s… in the NEW new media capital of the world… St. Petersburg, Florida! 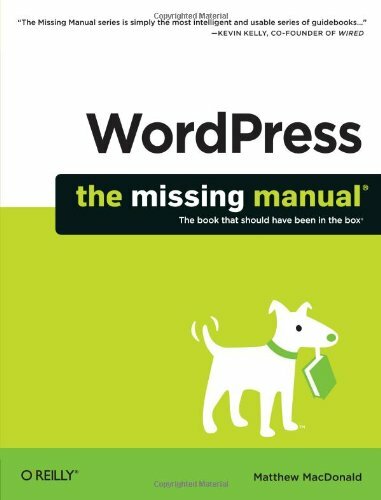 Order ‘WordPress: The Missing Manual’ by Matthew MacDonald, available from Amazon.com by clicking on the book cover above! I cannot tell a lie: Today’s show is mainly intended for an audience of one: me. Ever since I turned my back on Blogger in 2011 and finally embraced WordPress as the platform for the Mr. Media website, I’ve been eager to pick up tips and advice wherever and whenever I could. That’s why I invited Matthew MacDonald as today’s guest. His new book, WordPress: The Missing Manual, is supercharged with easy-to-digest information that everyone from beginners to advanced users could benefit from reading. MacDonald is a science and technology writer and the author of more than a dozen books including Creating a Website: The Missing Manual and HTML5: The Missing Manual. I hope you’ll find this conversation of interest, but either way, I’m barreling ahead and focusing on learning all about WordPress!